NBA Breakdown (Mon. 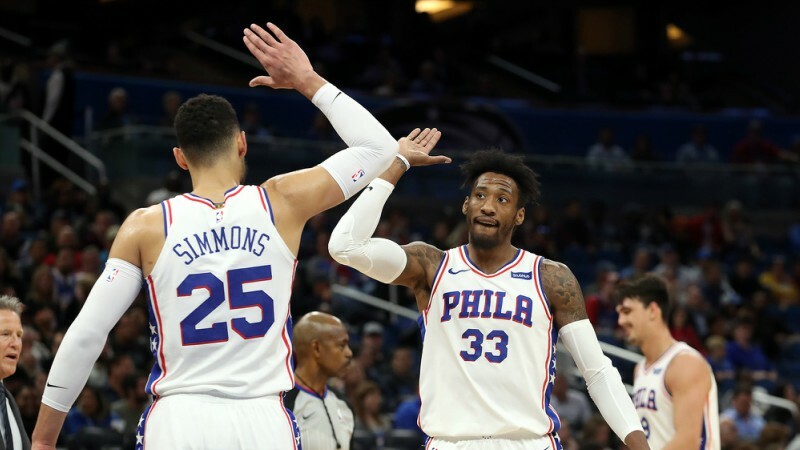 4/16): Sixers Due for Regression? 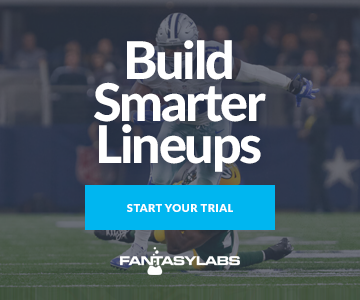 The NBA Breakdown offers data-driven analysis for each day’s slate using the FantasyLabs Tools and predictive metrics to highlight notable players. Monday features a two-game slate starting at 8 p.m. ET. Instead of the usual positional breakdown, let’s go game-by-game. The Heat ultimately ended up getting waxed by the 76ers in Game 1 of this series, but the game was a lot closer than the final score indicated. Miami actually held a three-point lead at halftime before Philadelphia scored a ridiculous 74 points in the final two quarters to pull away. We got our first glimpse into what Miami’s center rotation could look like in this series, and it appears that Hassan Whiteside will be on a very short leash. He played just 12.5 minutes in Game 1, which was less than both Kelly Olynyk (31) and Bam Adebayo (20.5). The Heat have been at their best this season with Olynyk on the floor — they’ve posted a net rating of +5.9 with him versus -3.8 without him — so he should continue to see a big role with Joel Embiid sidelined for Game 2. Olynyk has averaged 1.25 fantasy points per minute over the past month, giving him appeal at $6,400 on FanDuel and $6,100 on DraftKings. He also has one of the best individual matchups of the day; his Opponent Plus/Minus on FanDuel is +3.42. Justise Winslow also saw a big role in Game 1, playing a team-high 31 minutes off the bench after being a key part of Miami’s rotation down the stretch of the regular season. Winslow has exceeded value in seven of his past nine games on DraftKings, but unfortunately he doesn’t have a ton of upside given his $5,100 DraftKings salary — he’s gone for no more than 30.75 DraftKings points during that stretch. Goran Dragic could be a nice bounce-back target for Game 2. He posted a Plus/Minus of -4.66 on DraftKings in Game 1, but shot just 4-of-14 (28.6%) from the field, which should regress back up to his 45.0% mark this season. Dragic led the Heat in Game 1 with a usage rate of 28.9%, which represented an increase of 4.2 percentage points compared to his regular-season average. He’s been priced down to just $6,300 on FanDuel, giving him upside if he can shoot a little better from the field this time around. James Johnson and Dwyane Wade are also worthy of consideration on FanDuel, where each has a Bargain Rating of 86%. Johnson played just under 25 minutes in Game 1 but likely would’ve seen more than that if the game had stayed competitive in the fourth quarter. Regardless, Johnson’s averaged 1.00 FanDuel points per minute over the past month, and that’s all he’d need to have a shot at returning value at $5,200. Wade won’t play many minutes but figures to be extremely involved when he’s on the court. He posted a usage rate of 22.3% and an assist rate of 39.2% in Game 1, which are awesome marks considering his $4,500 salary. Philadelphia exploded for 130 points in Game 1, making them a prime candidate for regression in Game 2. Their offensive efficiency of 134.2 is obviously unsustainable, especially considering the Heat ranked seventh in defensive efficiency during the regular season. That said, their implied team total of 111.5 points is the top mark on the slate, so they will definitely be a popular target tonight. One of those games was a 40.5-DraftKings-point performance in Game 1, a game in which Ilyasova’s 32 minutes of playing time led all big men for the 76ers. Ilyasova should continue to be a big factor in the front court for Philadelphia, making him appealing on DraftKings given his Bargain Rating there of 99%. Robert Covington also has a Bargain Rating of 99% on DraftKings. Covington was one of the few 76ers to disappoint in Game 1. He was limited to just 26.5 minutes in that game due to foul trouble but is a prime bounce-back candidate for Game 2. He’s been one of the most important players in the entire league this season and should play more minutes in Game 2 if he can stay out of foul trouble. On the other end of the spectrum, Marco Belinelli is likely due for some negative regression. Covington’s additional minutes will likely come at Belinelli’s expense. Belinelli is also unlikely to shoot 9-of-17 from the field and 4-of-7 from 3-point range again in Monday’s contest. He could be a prime fade candidate after exploding for 38.5 DraftKings points in Game 1. Finally, Dario Saric stands out as the 76ers’ best value on FanDuel. Saric has seen a monthly salary change of -$1,200, and his $6,000 salary for Monday comes with a FanDuel Bargain Rating of 90%. He’s averaged 0.94 FanDuel points per minute over the past month and is currently projected for over 32 minutes in our NBA Models. The Spurs looked old and slow in Game 1 and are facing some serious questions heading into Game 2. San Antonio needs to try and generate more offense, but will that be possible without sacrificing too much on the defensive end? The public is skeptical, with over two-thirds of spread tickets and over 70% of spread money backing the Warriors as of this writing. Aldridge is nearly impossible to consider at his current $9,700 salary on FanDuel, especially given his projected ownership of 26-30%. One possible change that the Spurs could make for Game 2 is moving Rudy Gay into the starting lineup. Gay started the second half of Game 1 and offers much more offensively than Kyle Anderson. Gay led the Spurs with a usage rate of 31.5% in Game 1 and has averaged 1.20 FanDuel points per minute over the last month. He’ll be a nice value Monday if he sees more playing time. Outside of those guys, it’s tough to figure out what the Spurs rotation will look like in Game 2. Manu Ginobili was arguably the Spurs’ best player in Same 1, but it’s hard to bank on a 40-year old playing a huge role all series. That said, Ginobili has averaged 0.90 FanDuel points per minute over the last month and is currently priced at just $4,400; he’ll have some upside if he gets more minutes. Head coach Gregg Popovich has also emphasized that he needs more shooting on the floor, which could mean more minutes for Patty Mills, Danny Green, and possibly even Davis Bertans. All three of them were brutal in Game 1 but have shown the ability to shoot the 3 at a high level. The Warriors’ struggles this season without Steph Curry have been well documented, but it looks like they might be ready to flip the switch in the playoffs. They posted an offensive efficiency of 117.6 points per 100 possessions in Game 1, which is especially impressive given that San Antonio’s defense ranked third during the regular season in points allowed per 100 possessions (104.8). The Warriors didn’t need Kevin Durant for more than 31.5 minutes in Game 1, but he was still able to deliver 47 DraftKings points. Durant could play more in Game 2 if the Spurs can keep this game competitive, and he’s averaged 1.45 DraftKings points per minute over the last month. At a salary of $10,500 on DraftKings, Durant has a 99% Bargain Rating there, where he’s a better value than on FanDuel ($11,800). Draymond Green was an excellent value in Game 1, posting a Plus/Minus of +10.43 on DraftKings. Green demonstrated his trademark versatility, leading Golden State in both rebounds and assists while nearly putting up a triple-double. He only shot 5-of-13 from the field in that game, so he has the ability to post an even bigger stat line if he shoots the ball better. Klay Thompson also had a strong showing in Game 1 but seems like a prime candidate for negative regression in Game 2. Thompson shot 11-of-13 from the field and 5-of-6 from 3-point range, both of which are unsustainable even for an elite shooter like Thompson. He’s also seen a slight salary bump across the industry after exceeding his salary-based expectations in Game 1, so this could be the perfect opportunity to fade him. Andre Iguodala and JaVale McGee both entered the starting lineup to begin the playoffs and both seem likely to stay there for Game 2. Neither possesses a ton of upside given their limited playing time — Iggy played 23 minutes in Game 1 while JaVale played 16.5 — but each has the potential to be a solid value at his current price point. After this piece is published, FantasyLabs is likely to provide news updates on a number of players. Be sure to stay ahead of your competition with our industry-leading NBA News Feed. All odds accurate as of 3:25 p.m. ET on Monday, April 16.